Not so long ago, the biggest name in boxing, Floyd Mayweather, conducted an online poll to see who fans felt he should fight next, the slick yet vulnerable Englishman Amir Khan, or the rugged but more limited Marcos Maidana. Khan, a former Olympian, had a fan base eager to see their man go toe to toe with Mayweather. Khan, the reasoning went, was fast, even faster perhaps than the illusive Mayweather. What’s more, Mayweather’s limited punching power would mean that Khan’s Achilles Heel of a chin wouldn’t be in as much danger as it might be against a heavy puncher. When all was said and done, Khan won Mayweather’s fan poll, yet Mayweather chose to fight Maidana instead. It was a telling moment, not only for what it said of Mayweather’s personality, but of what it said of Khan’s ring ability. Now, nearly half a decade later, Khan is close to facing another of the biggest names in boxing in Terence Crawford. This time, though, the chance at glory won’t be denied the Englishman. For the Crawford match is signed, sealed, and ready to air on pay per view this Saturday night. It’s been a long time since Mayweather presented fans with his poll, however. Times have changed. A new breed of fighter has emerged, with Crawford right at the front of the line. Quiet and menacing as a gunfighter out of the old west, Nebraska’s Crawford is rightfully the favorite stepping into the ring on Saturday night. The current WBO welterweight champion of the world, Crawford has gone through the likes of Jeff Horn, Viktor Postol, Raymundo Beltran, and Yuriorkis Gamboa. Those wondering why there aren’t bigger names on Crawford’s resume might be best asking the managers of other top welterweights. The fighter himself, an ambidextrous nightmare of an opponent with a record of 34-0, appears willing to take on all comers. Fans want to see him fight dazzling fellow welterweight titlist Errol Spence Junior. At the moment at least, boxing politics is keeping that bout from happening. Alvarez, who Khan jumped weight to challenge back in 2016. Although often mocked for having a supposed elevated opinion of himself, Khan earned the respect of fans for being willing to risk his safety in order to achieve greatness. The fact that his safety ended up being a matter of brief but genuine after Canelo brutally knocked him unconscious, however, is something worth noting. And now Khan is risking it all again, this time against a feared and avoided foe who few give him a chance against. 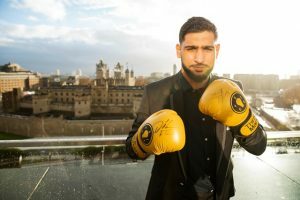 The consensus is that Khan will find success early on, but that Crawford, a master of adaptation, will eventually find his rhythm and that will essentially be that. Khan’s been knocked out or stopped three times in his career and few would be surprised if he ended up laid out on the canvas again this Saturday. Yet Khan’s legacy may end up being that he’s a man willing to buck the odds in an era where far too few fighters wish to really challenge themselves. Whether its yesterday’s greats, like Mayweather and Pacquiao, or today’s greats, like Canelo and Crawford, Khan has shown he’s never been afraid to risk getting his brain rattled to prove just how good he is. Whether he actually IS as good as he thinks is up for debate. Crawford is only one year younger than Khan, for instance, but the difference would seem almost generational at first glance. In other words, there’s a sense that if Khan was going to reach the top of Olympus, he’d have done so by now. Boxing, though, is a profession where most anything can happen…something the veteran Englishman is more aware of than most.